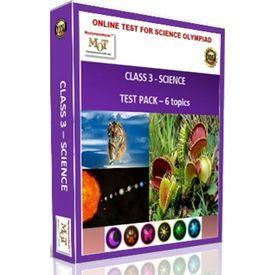 If your child is in Class III and appearing for Olympiad exams in Science like NSO or any other talent exam, this test pack will be highly effective for her / him. Once you invest in this pack, you can take tests for each topic up to 5 times. In other words you can have as many as 60 attempts including all topics. Each time, fresh set of questions will appear as the pool of questions for these topics are regularly updated and are "best of breed". We urge your child to take these free sample tests without any obligations whatsoever.